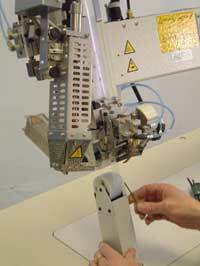 Machine installation and set up for production. Training for operators and maintenance personnel in the factory. Telephone / e-mail help line for advice on routine maintenance and settings. On site maintenance visits as required. WBM in house training courses. Charts detailing recommended machine settings for individual tape /fabric combinations. Advice and recommendations for the selection of Seam Sealing Tapes. A comprehensive range of genuine spare parts is available from stock for fast delivery.